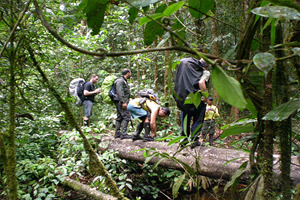 A trip to the Amazon rainforest and cloud forests of Ecuador is an unforgettable experience,. overwhelming the visitor with the immense biodiversity and cultural history of the peoples who have called the Amazon home for thousands of years. 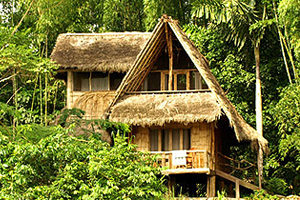 We offer options that range from explorer-style expeditions to the heart of the Amazon to luxury lodges set along Amazon tributaries deep in primary rainforest. If you are interested in learning Spanish while you stay in a lodge in the rainforest or cloud forests then we have programs that combine these activities. Click on the sections below to explore the options. The Amazon basin extends into Ecuador, and there are many fine lodges from where visitors can explore the stunning biological diversity and distinct cultures that live here . . . If you like the idea of getting off the beaten track and getting "up close and personal" with the wildlife of the Amazon on a small group expedition, consider one of these 4 - 14 day tours . . .